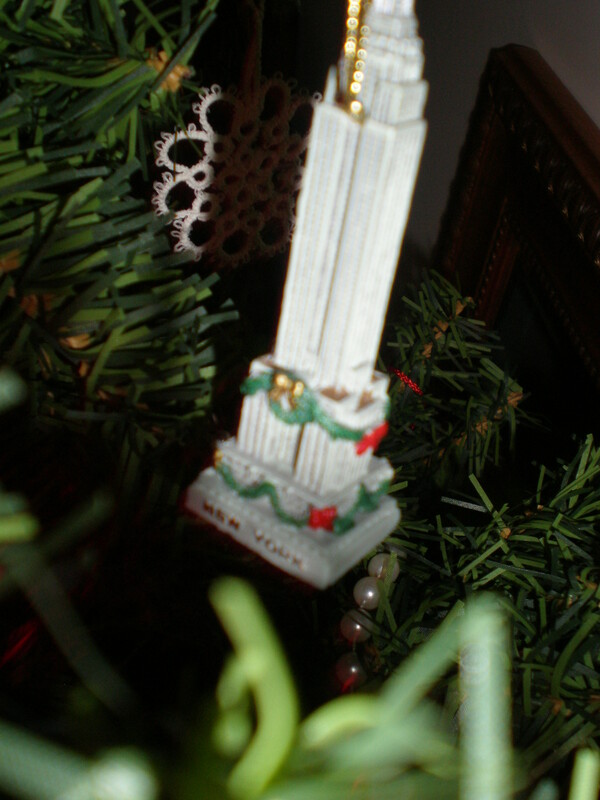 For the Twelve Days of Christmas, I have decided to share some of my Christmas ornaments and the story behind them! At night, at I believe my insistence, we decided to go to the top of the Empire State Building. Though I'd been to NY quite a few times, I never quite made it there (or the Statue of Liberty for that matter). The line was insane and further proof that things are never like you see in the movies. We missed our bus and would have to take the last one out. However, we made it up, and the view was indeed amazing. However, it was FREEZING. I cannot explain exactly how awfully cold it was. It was bitter biting cold blowing against us from all sides at a high altitude. Like millions of tiny needles simultaneously pricking you all over your body. But, I still couldn't stop looking at the city lights and the impressive grid of streets. I love NY and love deco buildings and seeing things from the sky. It was pure enchantment. Of course, there was a bus to catch and limbs to preserve. So, I went inside and bought this cheap ornament. We made it to the last bus at which point, 2 pushy ladies cut in front of us. We were cut off from getting on the last bus by, you guessed it, those two women. Fortunately, Greyhound added a bus and all was relatively well. We swore on the NJ Turnpike we'd never bus it again, no matter how inexpensive it was!